I loved this book! 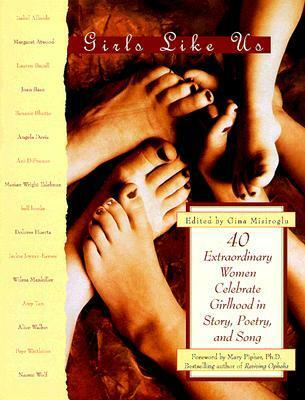 It was a great collected of stories, poems, and songs written by women all about girlhood. It celebrated their identity, family, girlfriends, mentors and heroes, and irreplaceable moments. It was so wonderful to see a book that celebrated the strength women found in their childhood. I learned more about a number of women I admired, and began to admire many women I had never knows about before! I now want to books by Isabel Allende, Benazir Bhutto, and at least two other women because of this book! It was an amazing read! A marvelous book about extraordinary women. An inspiration to all girls to be all that they can be. From the remarkable and painful stage fright of Joan Baez, to Benazir Bhutto's becoming "the first Bhotto woman to be released from a life spent in perpetual twilight", to a 12-year old Latvian girl's (Agate Nesaule) determination to teach herself English be comparing an English language version of 'Gone With the Wind' line-by-line to her more familiar Latvian language edition: This is an excellent anthology. I first read this when I was gifted it in middle school. I remember enjoying a lot more than I enjoyed this reread. Some of the stories were enjoyable but some of them were kind of dry and less readable. Some of the stories were also rather unrelatable in that they were about struggles of young girls of color dealing with prejudice. While I normally love diversity in my books, since this book seems to be mostly about letting girls know they aren't alone with issues they're dealing with, it seems like they could have made them more generic to general issues girls deal with regardless of race.